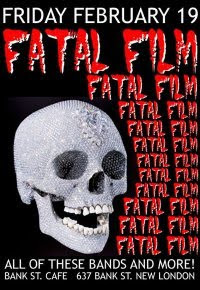 As you can see from the ridiculously funny flyer; Friday at the Bank St. Cafe in New London, you can catch Fatal Film doing an unprecedented three sets. That's an incredible amount of space to fill, so you'll probably catch some awesome tunes you've never heard from them before and insane covers. I know most people will be at the Andrew W.K. show in Hartford, but if you're in the New London area this is gonna rock pretty damn hard as well.